“That’s a carpenter worm," the chef said, pointing at a fat pink worm sitting on my spoon. “The worm is exorbitantly expensive… 200 grams will cost you at least Rs2,000 in the local market," he continued. “It is the saffron of insects." For the Tenyimia community in Nagaland, the carpenter worm, a pest otherwise, is a delicacy. Perhaps one of their most loved. Another local delicacy is the larva of a King Hornet. Chef Joel Basumatari from Nagaland explained these local delicacies as I tasted them, one after the other, at the 2015 edition of Indigenous Terra Madre (ITM) in Shillong, Meghalaya. Basumatari prepared his dish of assorted insects for one of the tasting workshops at this international gathering of farmers and indigenous food communities that took place last month. This year’s ITM—the first took place in Sweden in 2011—is a joint venture of the Indigenous Partnership for Agrobiodiversity and Food Sovereignty (Indigenous Partnership), Rome, Italy; Slow Food International, Bra, Italy; and the North East Slow Food and Agrobiodiversity Society (NESFAS), Shillong. Forty-one villages from Meghalaya agreed to be co-hosting villages for ITM 2015. As the names of the parties involved suggest, the event was a celebration of food that is not only sourced locally but also cooked and relished locally. 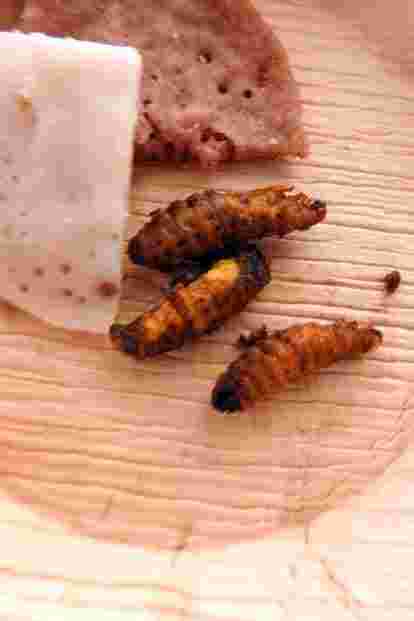 Along with the juicy carpenter worm, Basumatari’s dish featured an edible spider, a crunchy bamboo worm, crispy grasshopper and honeybees. The worm dish was served with sweet potato, tree tomato and bamboo shoot—vegetables that all seem comfortingly familiar in comparison to the protein on my plate. “Eating is first of all a cultural act," said Carlo Petrini, founder of the International Slow Food Movement. In 1986, Italian journalist Petrini was outraged when the American fast food chain McDonald’s opened an outlet in Rome. Petrini saw it not only as a blot on the historic urban landscape of Rome but, more importantly, as a threat to the culinary culture of Italy. He subsequently led a protest against the global industrialization of food. These protests culminated in the birth of the Slow Food movement on 10 December 1989 (see interview). Subsequently each year on 10 December, across the world, small-scale farmers and Slow Food practitioners get together to celebrate traditional food and reconnect with nature and Mother Earth. The day is annually marked as Terra Madre (Mother Earth) Day, or Slow Food Day. The idea is to promote the diversity of food traditions, support sustainable agriculture, fishing and breeding, all with the goal of preserving both taste and biodiversity. In Meghalaya, since 2010, this day has been observed as Mei-ram-ew—a term that means Mother Earth in the Khasi language. In much the same spirit as the global event, Mei-ram-ew is an opportunity for local food communities, under the auspices of the NESFAS, to showcase indigenous food traditions, customs and culinary culture. But why eat insects? Family and friends were aghast at my latest gastronomic pursuit. Few seemed aware of, or interested in, the nutritional value of these traditional dishes that I was gobbling up. They are packed with essential proteins, fibre and other nutrients. Insects, as is quite widely known, are nutritious alternatives to mainstream staples such as chicken, pork, beef and even fish. Many even have medicinal properties that are well known to the indigenous societies in which these insects are not distractions or oddities but items of daily sustenance. Take, for instance, the ant chutney presented at ITM by Sunita Rao. Rao is founder of Vanastree, a seed-savers collective run by women based out of Sirsi in Karnataka. Her chutney—delicious and tangy with a marsh green colour—was made from weaver ants with a coconut base by the Siddi community. The chutney is traditionally used to treat cough, cold and joint pains. An insect that is believed to be around 50 million years old, weaver ants are arboreal and are also used as bio-agents to keep other insects from infesting fruiting trees. 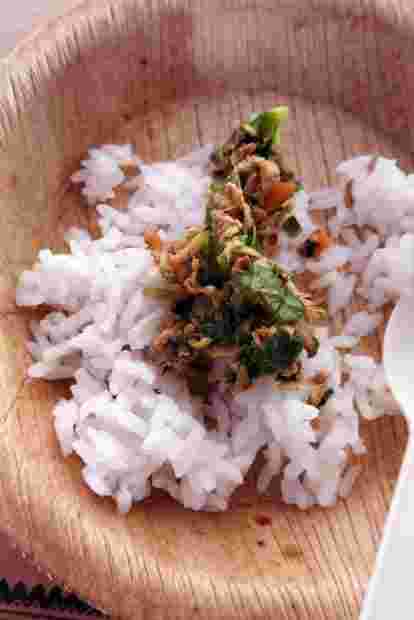 From Arunachal Pradesh came a dish made from riverbed beetles, presented by Jimsi Tassar, an assistant professor at Arunachal Law Academy. The riverbed beetle is a pest of the rice plant collected by the community when it settles under stones along riverbanks during the winter months. In Tassar’s preparation, the beetles were cooked with onion, garlic, chilli and tomato. The resulting dish was spicy with a strong sharp flavour—it was both familiar and somewhat unusual at the same time. According to Tassar, the beetle is used as a flavouring agent, especially in seasoning boiled fish. It is also consumed to ward off cold during the winter months. One of the most moreish dishes on offer was a Khasi one: cooked Eri silkworms and rice cake. It tasted like fried prawns. All the different insect food courses served at the workshop were testimony to a rich traditional knowledge: Which insects are edible and which are not? When and how do you harvest them? How do you combine them with flavours, flavour bases and spices? Which have medicinal purposes and which are eaten purely for pleasure? All of this is a wealth of knowledge that remains local and traditional, far removed from mainstream gastronomy. At the event, traditional communities, who were once perhaps embarrassed to share their culinary fare with people from the mainstream, were bursting with enthusiasm. They were eager to showcase wild edibles and many ITM delegates seemed genuinely impressed by their work and fervour. A new global audience witnessed how indigenous people in India’s north-east contribute to resilient food systems, where food is honoured and where well-being and intrinsic values are recognized as important components of local livelihoods. And insects form an important part of these food systems. Which should be anything but strange. According to the Food and Agriculture Organization (FAO) of the United Nations, insect consumption as food is not new. People across the globe have been eating insects as a regular part of their diet for millennia. It is estimated that insect eating is practised regularly by at least two billion people worldwide. More than 1,900 insect species have been documented as edible, and the most commonly eaten insect groups are beetles, caterpillars, bees, wasps, ants, grasshoppers, locusts, crickets, cicadas, termites, dragonflies and flies. The authors of a 2013 FAO paper, Edible Insects: Future prospects for food and feed security, stated that insects provide food at low environmental cost, contribute positively to livelihoods, and play a fundamental role in nature. However, these benefits are largely unknown to the public outside what are usually small traditional communities and indigenous food groups. In an era in which climate change is posing a threat to our survival, we may look towards insects as food that feed us without endangering the planet. Largely unknown to Indians, the Slow Food movement started by Petrini in the 1980s has gone global with more than 150,000 active members in 160 countries. The first Indigenous Terra Madre was held in June 2011 and was hosted by the Sami people in their Arctic homeland—in Jokkmokk, Sweden. The idea was to garner international attention to the wealth of traditional ecological knowledge and sustainable practices. The point was to show that human-environment relationships did not have to be a zero-sum game. Shillong, along with 41 villages, was chosen to hose the second ITM. North-east India was the obvious choice for an international Slow Food event as the region is rich in indigenous communities living in traditional settings. Further, the community retains ownership of the land rights and practises age-old traditional farming: all virtues held in high regard by Petrini and other Slow Food lovers. It was a five-day event packed with talks, workshops, field visits and a food festival. More than 600 delegates representing 140 tribes from 58 countries exchanged ideas, met old friends and made new ones. They ate, drank, sang and danced together. While the conference focused on how to shape a future for food that is more just, holistic and reverential of the land and its resources, discussions ranged across a broad array of topics. From promoting food sovereignty in indigenous populations and community conserved areas to supporting agroecology and agrobiodiversity. A constant thread connecting these sessions was an eye to the future—to create a future of food that is good for people and the planet. “Sustainable agriculture is key to a sustainable economy that is crucial for a sustainable democracy," said Meghalaya chief minister Mukul Sangma. “This is a great opportunity for us to reach out and connect with different cultures through food. Getting to know each other through food is a great way of understanding biodiversity." In a recorded video message, the UK’s Prince Charles, an ambassador of the Slow Food movement, said, “For indigenous people, land is not a commodity; it is a gift of god. In our modern world, we are totally disconnected from the wealth of traditional knowledge, which has guided countless generations... So, if we wish to maintain our civilization, we must look after the earth and actively maintain its intricate balance so it achieves a state of harmony and health." Petrini added, “We are going to collapse in the quest for money. In fact, we are on the verge of it. We are losing our history, our food heritage and memories. We are doomed to eat the same thing. We must fight and defend our own indigenous products, processes and techniques. I want to eat local products and I don’t care about standardization. If we eat and stay local, we can change the paradigm." The underlying driving ethos, if you will, of ITM is revitalizing lost or imperilled food systems. Food must not be seen as a commodity but as an intrinsic element of one’s cultural identity. “The survival of our land is in our children," said delegate Agustin Rosendo Uriana, a teacher from Wayuu, Colombia. “They need to know about the foods and the flavours of our ancestors." There were many stories of hope. American economist and activist Winona LaDuke spoke of the battle that the Anishinaabeg people have won in protecting their ancestral wild rice from genetic manipulation. This rice only grows in the shallow waters of the Great Lakes on the Canada-US border. She spoke of the amazing ability of the seed to wait patiently at the bottom of a lake until conditions are just right. Only then will it rise to the surface and grow once more, providing life for the Anishinaabeg who protect the waters where it grows. I had a chance to eat some of this extraordinary ingredient. Chef Sean Sherman, a Native American from Minnesota, presented the rare wild rice called Manoomin in the local dialect. 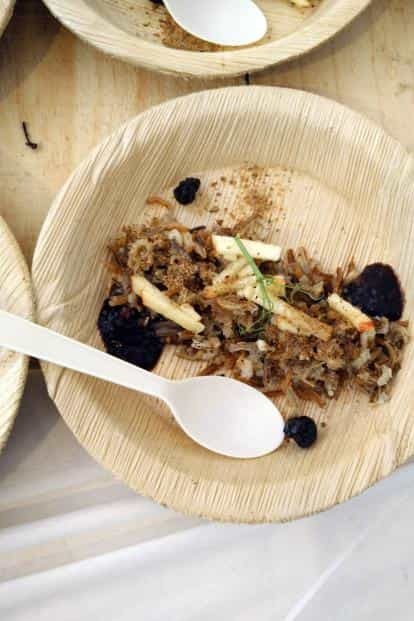 His “gourmet" dish featured naturally smoky flavoured Anishinaabeg wild rice with a dollop of sauce created from wild blueberries and apple, seasoned with maple sugar. It was extraordinary to not only taste it, but also to taste a Native American delicacy in Shillong. Sherman spoke about wild edibles and the pre-colonial food of Native American societies. Food that was rich in nutrients and vitamins. For example, he said, wild berries are a good source of omega-3 fats. This also holds true for edible worms. Sherman shared his experiences of going into the wild in search of wild berries, ginger, potatoes and tubers. “These wild foods grow only in certain seasons and for a brief period," he said. “So, we are extra careful in our pickings, making sure there is enough for wild animals and to maintain a balance in the ecosystem." Honey is the oldest sweetener known to humans. But at the Indigenous Terra Madre, we were treated to something different—honey that was bitter and left a strong, sour aftertaste. The north-eastern states are internationally recognized as a knowledge centre for indigenous bees and bee-keeping. At a honey-tasting workshop, we learnt about different bees and how they produce different types of honey, which taste different depending on the floral source. The bitter-sour honey came from the workmanship of Rock Bees, which collect nectar from jamun flowers. The Asian Honey Bee and the Little Bee produce sweet honey while the smallest of them all, the Stingless Bee, creates a tangy sweet honey. 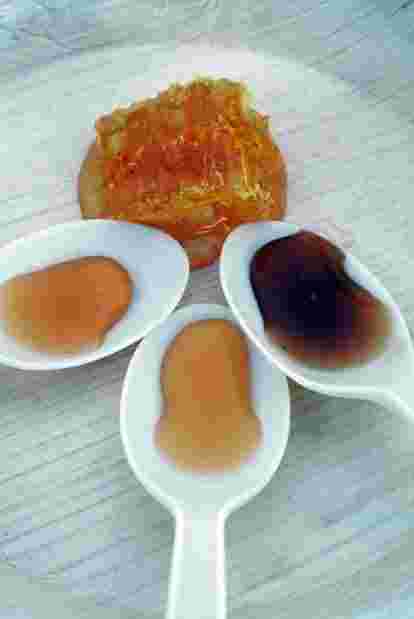 This honey is also used as a medicine to cure hand, foot and mouth disease as well as snake bites. The indigenous communities living in the Nilgiri Biosphere Reserve in the South Western Ghats brought the rare Kurinji honey to the ITM. The Kurinji or Neelakurinji, is a shrub that blooms once in 12 years in the high altitude of the Western Ghats. The mass flowering of the Kurinji transforms the mountain landscape into blue rolling hills. This rare event is celebrated in local folklore and lends the name Nilgiris or “blue mountains" to the region. It goes without saying that the honey of the Kurinji is a precious commodity. The honey is dark, almost black, in colour and carries its own distinct sweetness. it tasted like a smooth treacle. It was unlike anything I have tasted before. On the last day of the ITM, festivities took place by the side of the sacred groves in Mawphlang village. Here, the host villages showcased their range of pork dishes—smoked, dry fried and cooked in tapioca leaves. There was also dried and smoked fish with indigenous rice, while rice wine flowed in bamboo cups. Not a single soul missed the “gourmet mainstream". Instead, we ate and drank the Slow Food and the local wine and we celebrated a festival that seems vital to the future of food and humanity.